SEO isn’t for banal and unpopular niches—this is what some business owners believed when I first introduced them to search engine optimization. They thought SEO was only for popular businesses that people regularly search. So I explained that this notion was one big fallacy. I even elaborated that banal and unpopular niches were the ones that needed SEO the most. So you heard it right. SEO is for banal and unpopular niches. Actually, one of the reasons why SEO was created was to promote businesses that were still unheard and unpopular to people. During the early years of search engine optimization, it was actually the businesses and companies from the not-so-popular industries that made use of SEO’s capability to rule the then-uncrowded search engines. Through extensive and proper keyword research, banal niches can find their market with ease. Keywords are like map pins on search engines: they give you an idea where to position yourself on the market. For example, if you are into toilet seat manufacturing and you aim to sell your product to people who need your service, researching for keywords like “toilet seat manufacturing” or “manufacturer toilet seats” is a better move compared to just launching a website without highly-researched keywords on it. Moreover, a website or business owner cannot just pick a keyword that interests him or looks suited for his business. One should conduct a thorough research through Google Adwords and other keyword research tools like GoodKeywords and SEMRUSH to see the current competition and the global monthly search that will aid them to understand the viability and strength of a certain keyword. Since keyword statistics constantly change, having a trusted research tool or software is necessary. These days, researched keywords and phrases are not only for website and for blog content. 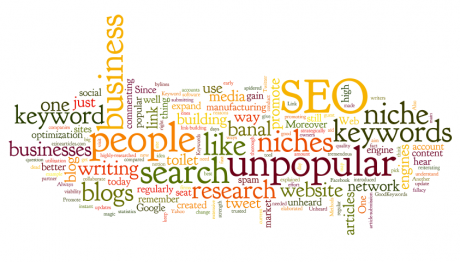 Most SEO firms today use the power of article writing to promote unheard and unpopular niches on the Web. In fact, there are many ways to do it. One way is by guest blogging on blogs that allow articles with keywords (in form of a link directed to your main website) in it aside from the customary bylines they offer. Another one is by writing keyword-rich articles and submitting it to high rank popular article-submission sites like ezinearticles.com, selfseo.com, and smallbizarticles.com. Don’t believe writers on the Web who keep on reiterating that link building is one dead SEO method. Saying such is like being naïve. Upon strategically putting keywords on your blog posts, it would be better if you collaborate or partner with same niche business blogs as well. Having link-building partners with same niche business blogs will strengthen the authenticity of your niche to the people who visit your site. Moreover, commenting on related blogs to promote your unpopular niche is a good and fast way to introduce your business outside your niche. But remember not to cross the border of responsible blog commenting. Always remember not to spam and over-promote. Since everyone has Facebook and Twitter accounts today, promoting your services directly through these sites is undeniably the best way to let people hear and be acquainted of your unpopular niche (social media marketing). If unknown and unpopular celebrities can gain instant fame with a tweet, then there is no question that you can do such thing as well. The only thing you have to is expand your network by adding people and businesses so more people can hear about your business, and “tweet” and “update” regularly so the people from your network won’t think that you’re just an automated account or an account created to spam. Also, you have to use important keywords on your tweet and updates to get high possibilities of being indexed and spidered by major search engines like Google, Yahoo!, and Bing. Yet Search Engine Optimzation is no magic potion that automatically puts you on the throne of success. Like other regular niches that rely on SEO, you still have to exert tremendous amount of effort in writing quality content for your blogs and articles, continuing your link building strategies to expand your network, and updating your social media status so you can gain new customers every day. About the author: Your post author, Warner likes tech and SEO so naturally works with Resell SEO who supplies private label seo for resellers only.